The Axedale Hall is situated in the centre of Axedale, on a large block of land, that includes a childrens playground. To me, it represents the community hub of Axedale. The Hall was built in 1945, however it seems there was earlier planning for a community centre, as the first minutes for the Hall Committee were recorded on 31 August 1938. Present at this meeting were Councillors Doak & Mill, Messrs Ryan, McKindley, Atlee, Lynch, O’Donogue, Carney, Lienhop, Drake, O’Dwyer & O’Brien. Any meetings that occurred prior to this date are not recorded in the minutes book. 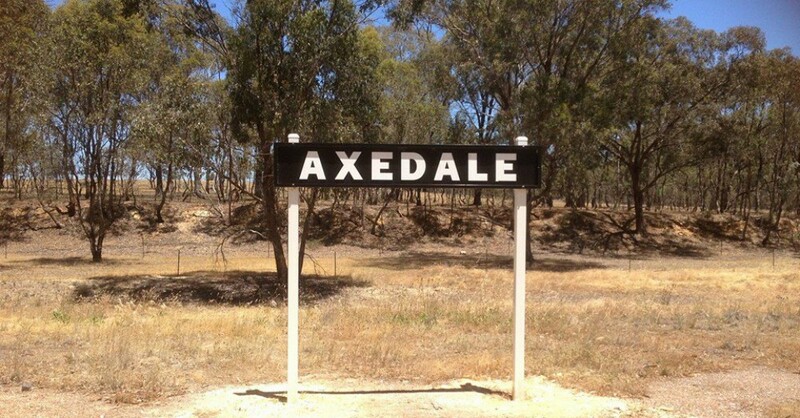 The minutes on 29 April 1944, record that Blocks 6 and 7 Section 5 Town of Axedale, be the site of the proposed Hall and that the committee accept Mr. Drakes offer of a free gift of the land, subject to Mr. Drake’s condition that the land would be definitely used for the erection of the Hall. The offer was accepted and a hearty note of thanks was sent to Mr. Drake for his generous offer. On 19 October 1943, the Executive Committee wrote to the Strathfieldsaye Shire Council, requesting that an application be made to the Minister of Public Works for a grant of 600 pounds on a basis of £2 for £1 as a post war construction job. On 8 August 1945, the minutes moved that the committee issue 5 year debentures minimum to be 1 pound interest on the debentures to be at 21/2%. The Axedale Hall was officially opened on 30 June 1945, by the Hon. J.H. Lienhop MLC, Minister of Public Works for Victoria. Many dignitaries attended and members of the Ladies Committee provided afternoon tea. This information is noted in the minutes of the hall committee. This was just a few weeks before the end of World War 2. A Roll of Honour to both World Wars was installed proudly and hangs today. The names of locals who served and also those who lost their lives is inscribed. The above plaque commemorates the opening of the water scheme in Axedale on 9 April 1964. On reading the minutes, it becomes obvious that the Hall Committee were hard working and very committed to getting the Axedale Hall built for the community. Today, the Axedale Hall Committee operates as an incorporated body of volunteers along with a Management Agreement with the City of Greater Bendigo. There are nine people on the Committee including a representative from the Pre-school. The Axedale Pre-School, which opened in 1992, is in the back part of the hall building. Originally that part of the hall was the supper room. There have been many events held at the hall in the decades since it opened, such as weddings, engagement parties and funerals. I have been told that there are many residents still living in Axedale, who celebrated their weddings in the hall. There have also been many official community functions held, such as school concerts, fashion parades, casserole luncheons, and children’s fancy dress parties. There have been 5 Debutante Balls held there over the years. The photos of these deb balls still hang proudly in the hall. As recently as 2004, indoor bowls was played in the hall on a piece of carpet, which would be rolled out for the occasion. The CFA used the hall for their meetings, while waiting for their new premises to become available. Today the hall is regularly used for private functions as well as community events such as Yoga Classes. The Axedale Hall Committee today, appear to me, to be a very active, vibrant, and hard working group of committed volunteers. They operate the local market and also support other local events. The above information was kindly given to me by Ann Mason, Axedale Hall Committee member for about 12 years. Anne lives on a property at Knowsley, about 10k from Axedale. Originally from Bendigo, Ann has been living at Knowsley since 1994 and is very actively involved in the Axedale community.